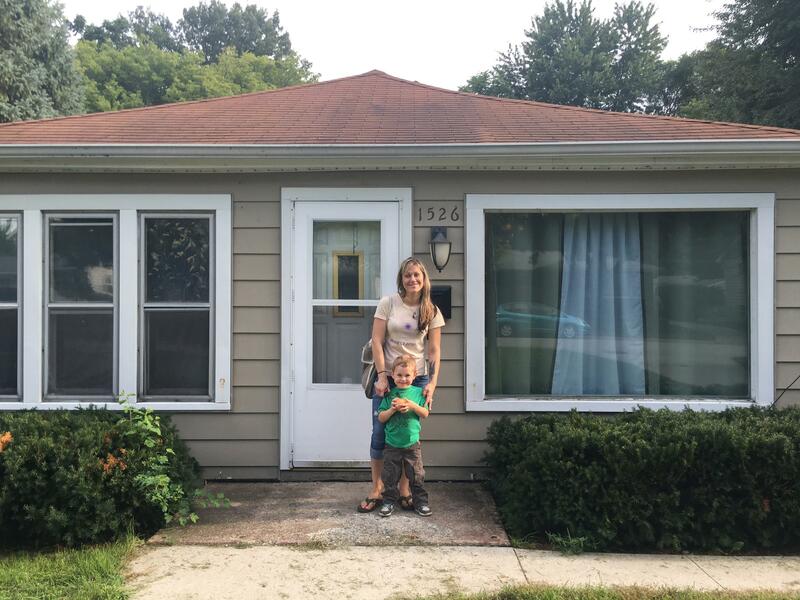 Jessica Depratter and her son Joe moved into this house in Port Huron after three years in transitional housing for recovering addicts. Jessica Depratter just moved into her new place in Port Huron. She's only been here for a couple of weeks, but she's already repainted her bedroom and is moving onto the bathroom, whose beige walls she describes as "the color of sadness." The yard backs up onto a small creek and a group of mature trees with sturdy branches. “We’re gonna put a tire swing on that tree out there and eventually have a garden next year," she tells me. 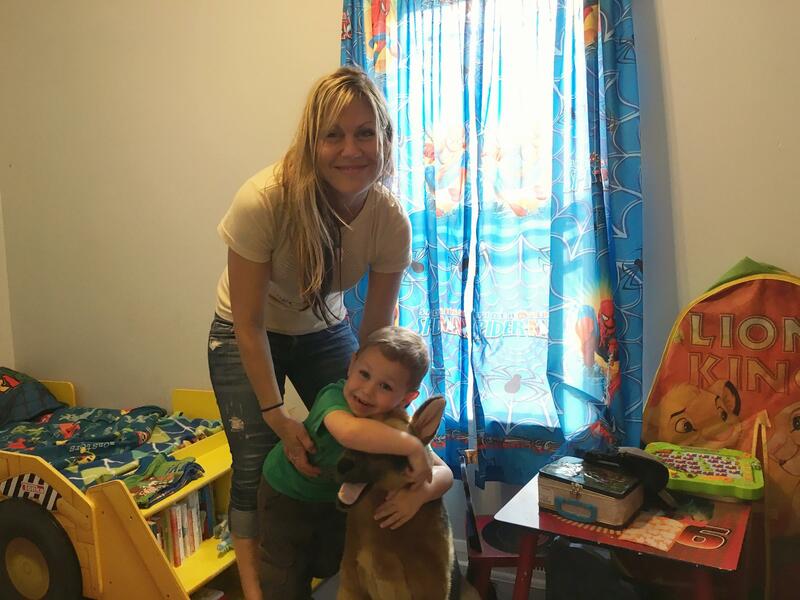 Jessica Depratter's three-year-old son Joe has decked out his new room with Spider-man curtains and his stuffed dog Berk. Depratter lives here with her boyfriend and her three-year-old son Joe. Joe's new room is decked out with Spider-man curtains, a bed in the shape of a bulldozer, and a stuffed German Sheperd named Berk that's almost as tall as he is. This one-story house is small, and on its deep lot looks even tinier. But it’s a big deal to Depratter. Four years ago, she was living in St. Joseph and struggling with an addiction to methamphetamine. She says she was surrounded by other addicts and bouncing from couch to couch. She rarely saw her son, who was living full-time with his dad. When she found out she was pregnant with Joe, she desperately wanted to get clean. But the rehab facilities close to Depratter wouldn’t take her. “They said, 'Well, with you being pregnant, it’s kind of high-risk, and we don’t take women that are of that nature or whatever. But there’s this place and it’s in Memphis and you could go there.' I was like, 'I will go to Tennessee, I don’t care,'” she says. Luckily for Depratter, it was Memphis, Michigan, not Tennessee. Actually Richmond, right next door. She packed the few belongings she had and got a ride 230 miles east to Clearview Women and Children Specialty Services. Paula Nelson says a lot of pregnant women struggling with addiction never make it that far. “First off, many women don’t want to come forward. And they’re scared. And they’re fearful that if they access services that possibly their children could be taken from them after they deliver them,” she says. Nelson is the President and CEO of Sacred Heart Rehabilitation Center, which runs Clearview. She tells me there’s a long list of barriers that pregnant and parenting women face when they’re trying to get sober. At the top of that list? Child care. “Some of the uniqueness of our program is the ability for mothers, in particular, to bring their children into treatment with them,” Nelson says. When you drive into the parking lot of Sacred Heart Rehabilitation Center, it looks like pretty much any other office park. You walk in the front doors and there's a receptionist behind a glass window to welcome you. Clearview Women and Children Specialty Services offers onsite daycare for the children of clients recovering from drug and alcohol addictions. Credit Courtesy of Sacred Heart Rehabilitation, Inc. But just beyond the receptionist's desk is a door that leads into a room decorated with bright green walls and multi-colored carpet. It's filled with books, toys, and mats for afternoon naps. Outside is a playground with a couple of slides and one of those giant tic-tac-toe games. 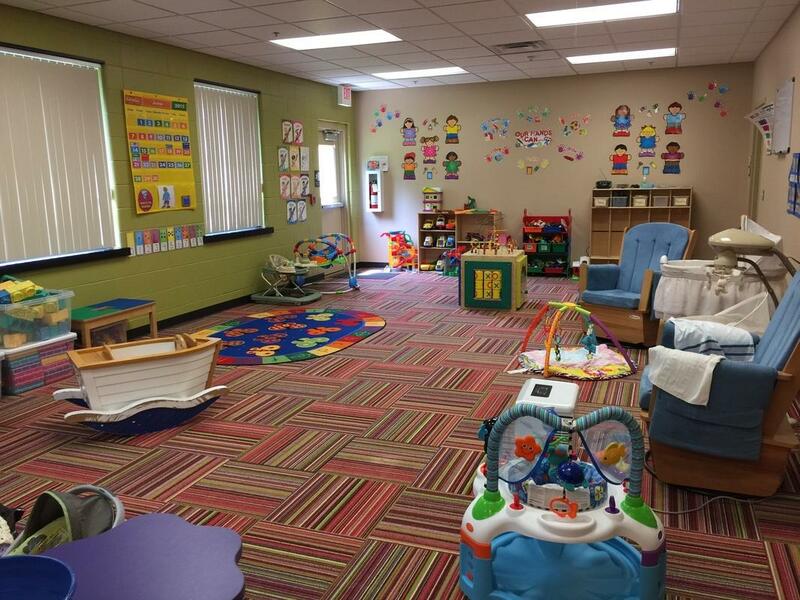 This is where Clearview's youngest residents attend daycare. Older kids are enrolled in the Memphis Community Schools district, and staff transport them back and forth from school everyday. Clearview allows women to bring in their children from birth through age 10 into treatment with them. Alongside their recovery treatment, women here take classes on parenting, cooking, budgeting, and other life skills. When the women aren't in classes, they're in charge of cooking and cleaning and taking care of their kids. These "family-centered" treatment centers first started popping up in the wake of the 1980s crack epidemic. In the 1990s, Congress funded the development a series of pilot projects for women's residential substance abuse centers that would provide onsite child care. The number of facilities like Clearview has grown significantly in the past two decades. But it’s still pretty small. Less than 4% of substance abuse treatment centers in the U.S. have beds for clients’ children, according to the Substance Abuse and Mental Health Services Administration (SAMHSA). Less than 4% of substance abuse treatment centers in the U.S. have beds for clients' children. Clearview is one of nine residential programs in Michigan that welcomes children in residential treatment settings. And it’s the only one in the state that allows women who are still going through detoxification or being maintained on methadone to live with their children. The additional supports aren’t cheap though. It costs more money to treat a woman at Clearview than it does at the adult facility across the parking lot. And while insurance usually covers the cost of substance abuse treatment, Sacred Heart has to find grant funds to pay for the extra services. But there’s research that suggests the extra investment pays off. An analysis by SAMHSA looked at 50 residential facilities that offered childcare and other support services. It estimated every $1 spent on these programs saved $3.70 in reduced crime, welfare spending, and foster care costs. For women like Jessica Depratter, the benefits are more immediate. Depratter has two felony drug possession charges, which means she’s banned from ever getting cash assistance or food stamps in Michigan. “And so I was a hungry pregnant woman, and I was really hungry. And so I was so grateful to come here and they gave me peanut butter sandwiches,” she tells me, choking up. After three years in Sacred Heart's transitional housing, Depratter is looking forward to having a place of her own. She's been a dog groomer for years, and now she'll finally be able to get her own puppy. Even though she's renting, she says she wants to make it really feel like home. When I ask Joe what he's most excited about at the new house, he points to one of those big trees with the sturdy branches. “My swing right there,” he tells me pointing to one of the big trees in the backyard. Depratter wants Joe to grow up with a stable home life, something she never had as a child. And she says this new house, with the new tire swing, is a good start. Looking for treatment for a substance abuse disorder? You can find a list of women's residential treatment centers in Michigan that have beds for clients' children below. Or you can search the SAMHSA Behavioral Health Treatment Locator to find a provider near you.